Grow in moist, acidic, well-drained soils in full sun. Tolerant of a variety of soil types, including poor soils, as long as the drainage is good. Plants prefer cool summer climates and dislike the heat and humidity of the deep South. Plants are generally tolerant of urban conditions. 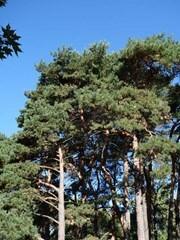 Pinus sylvestris, commonly called Scots pine, is a fast-growing, conical to columnar, medium sized conifer with distinctive flaking orange/red-brown bark. It typically grows 30-60’ tall in cultivation, but may reach 100’ in the wild. It develops an open-rounded, irregular crown as it matures. It is a very widely distributed pine that is native to northern Europe and northern Asia, but has also naturalized in parts of the northeastern and north-central U.S. It is the only pine that is native to Great Britain. Plants will vary in habit, hardiness and needle appearance depending on their specific native geographical growing region. Scots pine generally features (1) twisted, blue-green needles (to 3” long) in bundles of two, (2) gray to light brown cones (to 3” long) and (3) scaly orange/red bark in upper part but darker red-brown near the base. The common name of scotch pine is still popular, but is now considered by some experts to be inappropriate. Specific epithet means of woods and forests. Scots pine and its cultivars may be grown in the St. Louis area, but they will often struggle because of soil, climate and disease susceptibility. Sphaeropsis (Diplodia) tip blight can be a significant problem in some areas. Watch for pine wilt nematode. Sawflies, moths and scale may also appear. This is an important timber tree in Europe. A large number of compact/dwarf cultivars of this species have become popular landscape plants for rock gardens, foundations and other small areas around the home. Commercially grown plants are commonly sold as Christmas trees.